The Moon arrived home –to the sign of Cancer. With the Stellium in Pisces formed by Sun, Mercury, Venus, Neptune and Chiron, the Moon in Cancer invites us to spend time with our family, loved ones but also to find time to nurture our needs. The Moon will be growing as we will have the full Moon by the end of this week. We need to find our own time to inspire ourselves as under the romantic and sensitive Moon in Cancer! The Sun in Pisces is flowing with Saturn in Capricorn and Mercury is with Neptune hand by hand in our sky… We might feel exhausted dealing with responsibilities on one hand and dreaming on the other hand. WE MUST FIND TIME TO NURTURE OURSELVES. 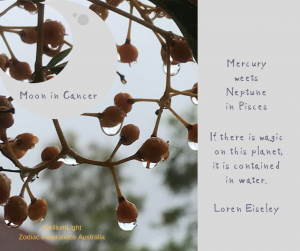 Mercury, the planet associated with our voice and our mind and Neptune, the planet associated with the imagination are having their annual meeting. This combination stimulates our minds with dreams and impressionistic way of thinking… WE MUST TAKE CARE OF OUR INSPIRATION!!! Read a poem, a novel or anything that allows your mind to develop imaginative positive ideas. Victoria Sackville-West was an English novelist and poet. She was born on March 2nd, 1892 in UK with Sun, Mercury and Jupiter in Pisces + Moon in Cancer. Neptune in her birth chart is with Pluto and supported by Uranus… She published more than a dozen collections of poetry during her lifetime and 13 novels. She was twice awarded thefor her pastoral epic: The Land.